An electronic attenuator may be viewed as a variable resistor controlled by current through its control port. 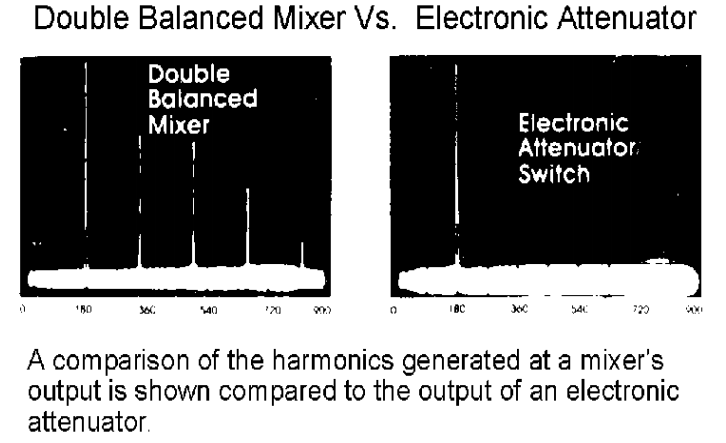 If a pure signal is applied at its input, harmonics will not be generated over most of the device's operating frequency range; however, some amount of harmonics will appear at the very low frequency end of the band with the amplitude determined by input power level and frequency. The minimum insertion loss of an electronic attenuator will occur at the highest value of control current, 20mA for Mini-Circuits' models. The minimum insertion loss value will increase as frequency rises so that, for example, the 1-200 MHz PAS model will have a l.4dB insertion loss while the 100-2000 MHz PAS-2000 will have a 4dB spec. Generally speaking, the return loss is a function of control current. The higher the control current, the higher the return loss (closer to 50 ohms); as current decreases, return loss drops, resulting in a higher VSWR. A useful feature of Mini-Circuits' electronic attenuators is the ability for either a positive or negative control current to provide the same amount of attenuation between input and output; this makes it useful for biphase modulation applications. The computer- automated performance data (CAPD) included for Mini-Circuits' electronic attenuators charts the phase difference between plus and minus modulation as a function of RF frequency. The attenuator/switches are economically priced while covering the very broad frequency range from 1 to 2000 MHz. They offer low insertion loss (1.4 dB) high isolation (65 dB) and exceptional unit-to-unit matched performance. Applications include power leveling and bi-phase modulation as well as current-controlled attenuation. must be defined at a particular value of control-current. The minimum insertion loss for Mini-Circuits' units is the difference in power from input to output with 20 mA at the control port. insertion loss of the attenuator from input to output port when there is no current applied to the control port. insertion loss of an electronic attenuator measured from the RF input to control port. This insertion loss is independent of the amount of control current and is dependent on the transformer used to provide coupling from RF input to the internal diodes. the amount of reflected power at the input relative to the amount of incident power at the input for a specified control current. At very high control current, return loss is very high; at low control current levels, return loss is very small.